google-site-verification: google8d8438b214143f71.html Beautiful Quotes: Live. 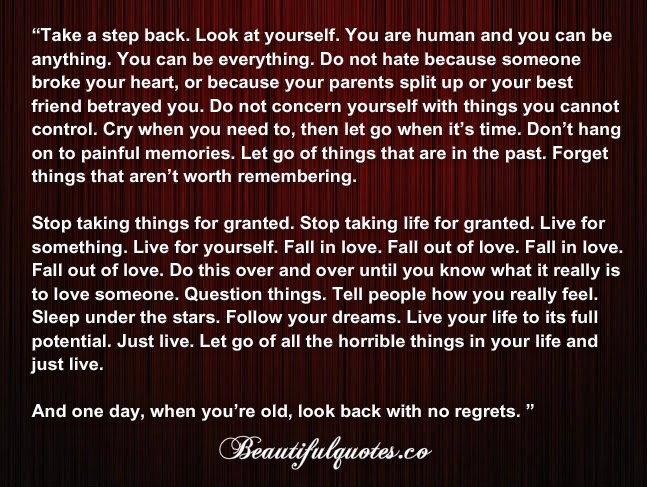 “Take a step back. Look at yourself. You are human and you can be anything. You can be everything. Do not hate because someone broke your heart, or because your parents split up or your best friend betrayed you. Do not concern yourself with things you cannot control. Cry when you need to, then let go when it’s time. Don’t hang on to painful memories. Let go of things that are in the past. Forget things that aren’t worth remembering. Stop taking things for granted. Stop taking life for granted. Live for something. Live for yourself. Fall in love. Fall out of love. Fall in love. Fall out of love. Do this over and over until you know what it really is to love someone. Question things. Tell people how you really feel. Sleep under the stars. Follow your dreams. Live your life to its full potential. Just live. Let go of all the horrible things in your life and just live.